Andy Pryce is head of 'Counter Disinformation and Media Development' at the Foreign and Commonwealth Office in London. 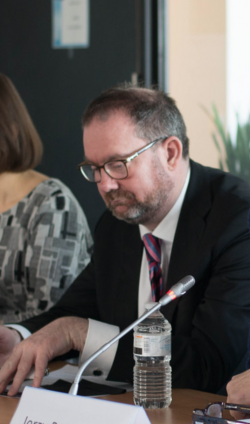 Andy Pryce presenting at the European Endowment for Democracy on 5 March 2018. In the five weeks since the attempted assassination of ex-spy Sergei Skripal and his daughter Yulia, Moscow has been pushing out conspiracy theories. Whitehall sources say two in every three stories shared on social media are from media outlets backed by the Kremlin – and are designed to deflect attention from accusations that it is responsible for the Salisbury attack... The fact that British ministers have to remain tight-lipped while the painstaking probe by police, intelligence services and Organisation for the Prohibition of Chemical Weapons laboratories takes place, has left a vacuum, which is being filled by Russia. Of 21 Russian theories, the most outlandish include: Ukraine did it to frame Russia; Britain did it to deflect from negative attention over Brexit to the claim that it was an attempted suicide by Skripal himself. Until a fortnight ago, the Foreign and Commonwealth Office seemed content simply to post statements rebutting the most outrageous claims. But the last fortnight has seen a series of mini-videos, which, sources say, “mark a departure” from the norm. They are said to be the brainchild of Andy Pryce, the FO’s head of counter-disinformation and media development. Another was captioned; “This is how the Russian state is spreading disinformation following the Salisbury attack. We know the tactics they use but they don’t change the facts.” The clip urges viewers to “think critically” and examine the facts, such as Britain’s decision to use the independent OPCW to verify UK claims that Russia supplied the nerve agent. What Do They Know Head of Counter Disinformation Mike Robinson made this Freedom of Information request to Foreign and Commonwealth Office. 9 april 2018. ↑ UK using graphic videos in war of words with Putin THE Foreign Office is using sophisticated graphic videos in a counter-strike against Russian propaganda. Daily Express, PUBLISHED: 00:01, Sun, Apr 8, 2018 | UPDATED: 10:16, Sun, Apr 8, 2018. ↑ Euractiv Disinformation - the playbook and how to fight it: 2018 Brussels DisinfoLab, accessed 27 November 2018. ↑ Schuman Trainees Committee - STC added 3 new photos. 12 April · Luxembourg, Luxembourg. ↑ Integrity Initiative UK Cluster Uploaded by Anonymous Europe on Nov 02, 2018. This page was last modified on 28 November 2018, at 13:12.